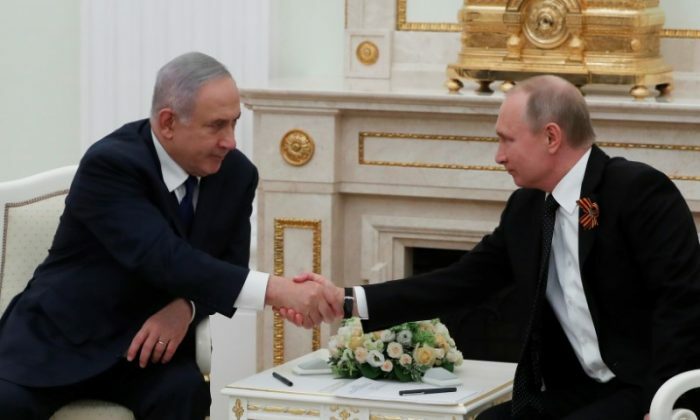 JERUSALEM—Russia is unlikely to try to limit Israel’s military actions in Syria, Israeli Prime Minister Benjamin Netanyahu said on Wednesday after meeting Russian President Vladimir Putin. Since intervening in the Syrian civil war on behalf of President Bashar al-Assad in 2015, Russia has generally turned a blind eye to Israeli attacks on suspected arms transfers and deployments by Assad’s Iranian and Lebanese Hezbollah allies. Netanyahu flew to Moscow on Wednesday to meet Putin, hours after U.S. President Donald Trump quit the Iranian nuclear deal and after Syria accused Israel of carrying out a fresh missile strike on an army base near Damascus. “Given what is happening in Syria at this very moment, there is a need to ensure the continuation of military coordination between the Russian military and the Israel Defence Forces,” Netanyahu told reporters before departing, referring to a hotline designed to prevent the countries clashing accidentally. After the talks with Putin, Netanyahu sounded upbeat. “In previous meetings, given statements that were putatively attributed to — or were made by — the Russian side, it was meant to have limited our freedom of action or harm other interests and that didn’t happen, and I have no basis to think that this time will be different,” he told reporters in a phone briefing. There was no immediate comment from the Kremlin. Netanyahu’s relationship with Putin has been buoyed by a long-running Israeli courting of Russian sensitivities. During his 10-hour Moscow visit, the Israeli leader attended, alongside Putin, annual Red Square celebrations of the anniversary of the end of World War Two. Israel recognises the Russian date, May 9. Most Western powers mark it on May 8. “When the president of Russia invites the prime minister of the state of the Jews to stand alongside him at the parade symbolizing the Red Army’s victory over the Nazis, its liberation, also, of the (concentration) camps, of Jews and others – for Russia, that is very significant,” Israeli Intelligence Minister Israel Katz told the Ynet news site. Last week, Israeli Defence Minister Avigdor Lieberman used a Russian newspaper interview to remind Moscow that Israel had not joined Western sanctions against it over the Crimea crisis and the poisoning of a Russian ex-spy in Britain. Over the last few days, airstrikes have been exchanged in a surge in tensions between Israel and Syria, where Iranian and Lebanese Hezbollah forces have been backing Syrian President Bashar al-Assad in his war against rebels seeking to oust him. Israel describes Iran as its biggest threat and Hezbollah as the biggest threat on its borders, and fears that Iran and Hezbollah are setting up a front against it.